Welcome to Jeep, the setting of Nicola Griffith’s debut novel Ammonite. The opening pages give a sense of claustrophobia as Marghe Taishan, in a quarantined part of a station orbiting Jeep, readies herself to be inoculated with a vaccine against the virus. Marghe is an anthropologist working for the Settlement and Education Council of the Durallium Company. Her contract is to travel to Grenchstom’s Planet and “study over a million people who had been out of contact with humanity for two or three hundred years” (pg 6). Jeep was a former colony planet, but the virus closed the world and the people of Jeep are now unknown quantities to the Company. The Company, perhaps as any company would, sent Marghe as a test subject for the vaccine and probably to find what Jeep can be worth to the Company. Marghe is there for the opportunity as an anthropologist. She carries some emotional baggage with her relating to her previous stint working for the Company. Nicola Griffith explores Marghe’s history as a natural part of the storytelling of Ammonite, and manages it without infodumping the reader. Now, it would be perhaps an attempt to avoid the elephant in the room if I didn’t bring up the fact that this is a novel featuring a planet populated entirely by women – and moreover, that all female population manages to reproduce without males, and further – that all men die from some strange virus on the planet. 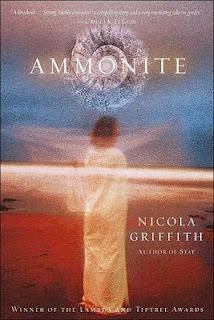 I don’t wish to diminish Nicola Griffith’s intentions and accomplishments with Ammonite to call the gender issue “window dressing”, but the fact is, when you read Ammonite you’re probably not going to pay too much attention to the fact that there isn’t a single male character in the novel (excluding a flashback). What you’re going to pay attention to is the fact that Ammonite is entirely populated with “people”. What you’re going to pay attention to is the story Griffith is telling. What you’re going to pay attention to is everything you pay attention to when you read. It is only after the fact that we realize just what it is that Nicola Griffith did here. She twisted a number of conventions of science fiction and she did it so skillfully that if you don’t look closely, you might have missed the mechanism because you were caught up in the show. This “sort” of novel of discovery and exploration tends to be male focused and male dominated and here, the women are not simply men with female names. They are women. The idea of the all-female society doesn’t look like the various cultures and tribes of Ammonite because the idea of the all-female society is a broken cliché that doesn’t treat women as actual people. Griffith gets at this in the essay that follows the novel. If you think this was all some great accident that Griffith just happened to write into the novel, think again. This was intentional and it was skillful and it was seamless with the actual storytelling. As much as it is about anything else, Ammonite is a novel that questions what family and identity really means. To Griffith, or more accurately – as presented in Ammonite, family is about what is chosen and what the responsibilities and consequences of that choice are. Most novels don’t really get at this in such a clear way. There are families, and sometimes characters get to choose a family, but seldom does what that acceptance of family means come across so succinctly. Sometimes it takes different cultural norms to spell it out and have it not feel like a lesson. Taken out of context, the above passage is a good explanation of what a family is. Taken in the context of Ammonite, it is a beautiful and powerful moment. Ammonite is filled with such moments. As a collection of individual moments Ammonite would probably still be a powerful novel, but Nicola Griffith does so much more than just string together moments with string. Ammonite is a complete novel, strong and whole, with depth and layers I’m sure I haven’t seen yet on a single read. This isn’t to suggest that it is dense and impenetrable, because it isn’t at all. It is to suggest that Ammonite is filled with richness of storytelling and is a novel that should sit with the reader long after the last page is turned and the cover closed. It is to suggest that Ammonite features oh so very real characters who all have their own agendas and needs and wishes, and that I may not have parsed them all correctly the first time through. It is to suggest that Ammonite is, without question, one of the best novels I have read so far this year. You know those books you finish reading and you know you must read everything else the author has written? Ammonite is that book. Good review. You make a strong case for the book. It sounds a bit like early Ursula Le Guin, which I love and have been reading a lot of lately. It's definitely worth a look. I haven't read much Le Guin (a serious gap in my reading), so I don't know if that comparison is apt, but Ammonite is quite good. Well said. Makes me want to go pick it up and start re-reading it right now. And it was for me too one of "those books you finish reading and you know you must read everything else the author has written." And I found that all of Nicola Griffith's books are the kind one goes back to again and again. I began my reading of Nicola Griffith with Always, the third in her series novels about Aud. Not science fiction but so enthralling that I worked my way backward through the three stories and fell in love with the writer's style. Slow River came next, a novel of the near future, with another strong cast of characters. Ammonite just sealed her place on my permanent book shelve. Your review is correct to point out that "As much as it is about anything else, Ammonite is a novel that questions what family and identity really means." and in doing so entertains and enlightens right up to the very end. Griffith's novels are by definition mind-bending. They will make you think about things you had no idea you could even think about at all. She takes you to another world, literally. Ammonite is an amazing tale that gives queer women a story about themselves to read in an alternate universe that we might wish actually existed. This is a sci-fi novel must read that you won't be able to put down. A many layered, original story about societies, both old, new and evolving with an interesting heroine, in fact many heroines. We could learn a thing or two from a brilliant story like this.